Well, Andie and I put in a few hours of clearing, and we did have a fire. Interrupted by Mrs ShoutyPantsOverTheFence who, despite the wind blowing in totally the opposite direction, objected to the fire in the strongest possible terms. Ours wasn’t the only fire, but unfortunately it was the only one she could see. On the plus side, all the brambles are down and burned, and lots of the debris is either gone or piled on my bit of the plot. There was the ruin of a greenhouse under the brambles, concreted in at the corners, with some form of degraded poly plastic roof. And lots of compost bags under soil. The brambles still need to be dug out and then Andie should be ready to go. My plot hasn’t seen such an impressively visible amount of work. I’ve moved the 9 beets I want to save seed from to the pink bed, seen that the salsify is going from strength to strength, fed & weeded saffron, broad beans and shallots and repotted the pomegranate seedling I brought back from Paolo’s garden at Castelleale. The fig twig in the shed appears to have swelling buds on it, so fingers crossed it will have taken. Yay! Following a handy tip that new leaves on leeks means the flowering stage isn’t far off, I’ve removed them all and will be having a very large leek and potato soup… The beets I moved also have new growth showing – somewhere in the shed I have a big fleece bag to put over the group and I hope that’s enough to keep out the unwanted chard pollen that might otherwise cross with them. My Saturday session ended up being mostly chatting. It turns out it is much easier to get people interested in the potential site seed circle if I talk to people and I also get to meet people I don’t know. So, with the people I spoke to, plus the ones I have had emails from, that one is up to about 14. Not bad at all, and there’s time to organise a meeting in the pub before they change their minds. At home I have a stack of potting on and sowing to do, but I’m far too tired to do it tonight. However I can see that my Rhubarb Curse is lifted! Hurrah!! 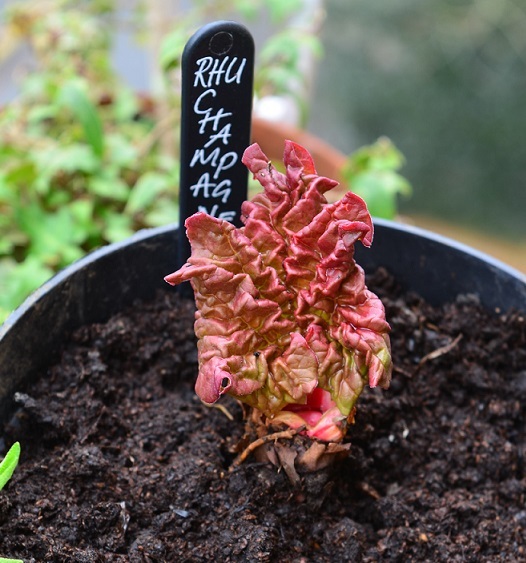 The dried out root of Champagne rhubarb I bought from a garden centre sale in January is sprouting. The spuds I planted in a bag at the end of February showing through and I am gradually filling the bag with compost. It’s not all good though. I made the mistake of soaking peas too long, and they have all rotted in the planter. They stink. Blech.